Supports Wireless LAN: IEEE 802.11ac/n/a/g/b for ultra high-speed image transfer using both 2.4 GHz or 5 GHz. 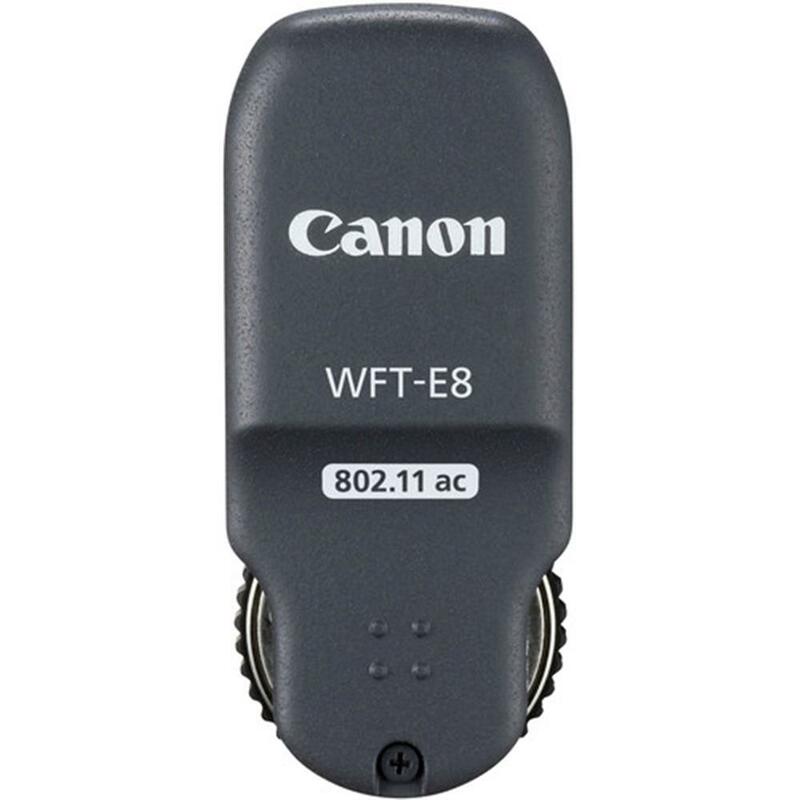 Connecting to wireless Local Area Networks (LAN) via standards of IEEE 802.11ac/n/a/g/b on both 2.4 and 5 GHz bands, the Wireless File Transmitter WFT-E8A is the first Canon WFT that can communicate on the IEEE 802.11ac standard. On this fast standard, the WFT-E8A can transfer data at speeds of up to 433 Mbps, almost three times faster than on the IEEE 802.11n standard, at a range of up to 492 ft. Transfer images at your convenience using FTP transfer, EOS Utility, WFT Server or Canon Camera Connect app. The Wireless File Transmitter WFT-E8A offers a number of convenient ways to transfer images based on the location, available equipment and the task at hand. Image transfer directly from the camera to local or offsite servers is facilitated via easily configurable FTP transfer. With Canon's refined EOS Utility software installed on a PC, full-featured Live View remote shooting and image transfer are made simple. Accessed through a browser on a computer, tablet or compatible smartphone, Canon's WFT Server enables offsite still and movie capture without the need for additional software. Plus, with Canon's free Camera Connect app, remote operation and image transfer can be completed simply on a compatible smartphone or tablet. Smart device connection is now available for remote shooting, sharing and transferring of images and video using the Canon Camera Connect app. Canon's free Camera Connect app makes it simple to connect a compatible smartphone or tablet to the EOS-1D X Mark II camera using the Wireless File Transmitter WFT-E8A. Remote operations such as Remote Live View still and motion capture, camera setting changes plus transferring images and MP4 movies are easily facilitated through the app's simple and clear user interface. Specially designed for use with the new EOS-1D X Mark II camera, with an improved UI, organized settings and a more simple display configuration. Made to work seamlessly with the EOS-1D X Mark II camera, the Wireless File Transmitter WFT-E8A features dust- and moisture- resistance, and is also powered by the camera itself. Its new User Interface is designed to create wireless configurations of all levels of complexity, enabling wireless shooting and transfer of images and helping to create multi-camera wireless setup. Thanks to its reliable and robust wireless connections, the WFT-E8A helps enhance the creative options available to EOS-1D X Mark II users in both still and motion capture. Wireless time syncing can sort images captured by multiple cameras and determine the accurate shooting sequence. Syncing cameras is simple with the Wireless File Transmitter WFT-E8A's wireless time syncing feature. Capable of syncing time on up to ten EOS-1D X Mark II cameras, the WFT-E8A enables recording of a timed succession of images from different sources and can be saved with a dependable level of precision. Event photographers will find this feature especially helpful as it's now possible to make time adjustments without having to connect directly to a computer. Compact, durable and lightweight body sealed for dust- and water-resistance. Portability is almost as important as how well a product functions. Offering a compact design, the Wireless File Transmitter WFT-E8A is both light and compact. Built to withstand inclement weather, this transmitter has the same dustproof and waterproof construction used in the EOS-1D X Mark II camera body. A durable design helps ensure that equipment can be safely used in various conditions, making the WFT-E8A an ideal accessory for demanding photographers constantly on the move. When a fully charged Wireless File Transmitter WFT-E8A is used with the EOS-1D X Mark II camera.Under Camera & Imaging Products Association (CIPA) conditions for testing shooting capacity, when using automatic image transfer with images that are approx. 6MB.Fewer images can be transferred if the wireless LAN transfer speed drops, and for consecutive image transfer over wireless LAN.If the remaining battery level drops below 19%, captured images cannot be transferred.